Modern and traditional kitchens alike enjoy the sleek, clean and professional look of stainless steel surfaces incorporated on many of today’s appliances. However, as new owners of stainless steel appliances quickly find, it is not the easiest surface to keep clean and shiny. Within days of use, many stainless surfaces become smudged with fingerprints, stains and grime previously undetectable on painted or enameled surfaces. Common household spray cleaners may clean the surface of stainless steel but they leave behind streaks, fingerprints and stains. Most spray cleaners designed specifically for stainless steel contain oil and dangerous, flammable solvents and should be used away from sources of ignition. Though they appear to polish the surface, these oil based products often have offensive odors not ideal for food preparation areas. The shiny glow left by oil/solvent based stainless steel cleaners is actually a thin layer of oil spread over the surface covering or smearing soil and stains. Over time, the surface becomes a dust magnet and the oily film darkens the stainless surface. Directions for Use: For initial cleaning of surfaces exposed to cooking splatter (hoods, ranges) or previously cleaned with “oil-based” cleaners, spray eAppliance liberally and completely on the stainless surface and allow it to sit for 15 seconds. Wipe clean with paper towels. Repeat this step with clean paper towels until the oil films are removed. Once the oily film is removed, eAppliance is easy to use and leaves a true, clean and bright stainless surface. Spot cleaning and light cleaning to remove fingerprints, etc., can be easily performed using the spray and a microfiber cloth. Use eAppliance similarly on all of the other recommended surfaces. 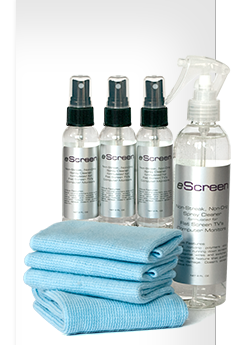 Please email admin@escreencleaner.com for more information regarding eAppliance.